This one’s a serious design problem. 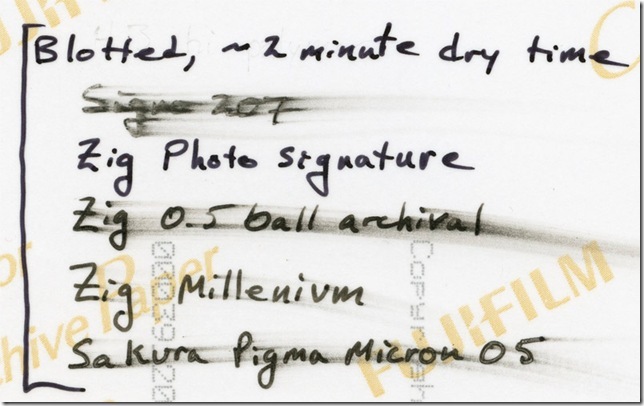 Kodak says use a soft pencil, # 0 or 1, which they say doesn’t harm photos. Being just carbon, after all. But they also say that for many years, all color photo paper has been “resin coated” meaning coated with a plastic. And laws eliminating volatile solvents have killed off many old tried and true mixes/inks. What you want is a pigment dispersed in a liquid that dries quickly, doesn’t penetrate, and yet bonds the pigment to the plastic. No wonder you’re having trouble finding a pen that works. I’m thinking the solution lies with either compounding something using a volatile solvent (toluene?) with colloidal carbon (lampblack) and some kind of binder. Something like shellac. Or press in a soft metal, like stamping with gold leaf? Or just punch near the edge with a bunch of holes to form a serial number? Just noticed. These photos, and I think this is universal, have been annotated on the back using some sort of type concurrent with their production. What did the processing lab use? I wanted to add that some of these pens do not work on Prinstagram/Instagram prints. They use card stock and not photo paper but I wanted to add this for anyone else who might read this otherwise very helpful post! The Millennium pens do not dry, even after 12 hours. 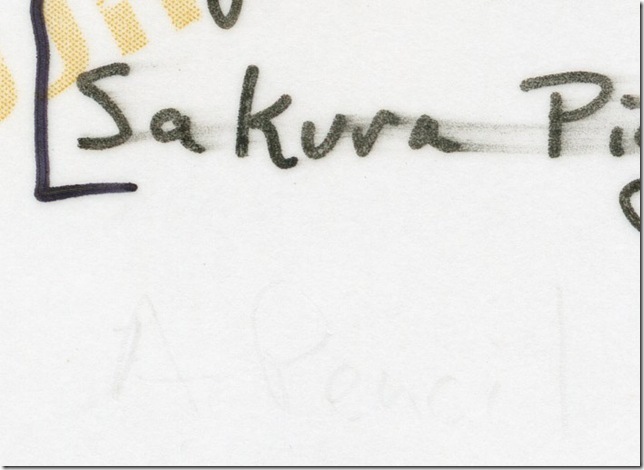 Sakura Micron pens don’t really dry either, but they get closer to dry than the Milleniums, ha. I have no experience with Prinstagram/Instagram, but it sounds like they are using a plastic-coated paper like most printers. I don’t love any answers, but that is exactly the problem I have been struggling with for all these years. 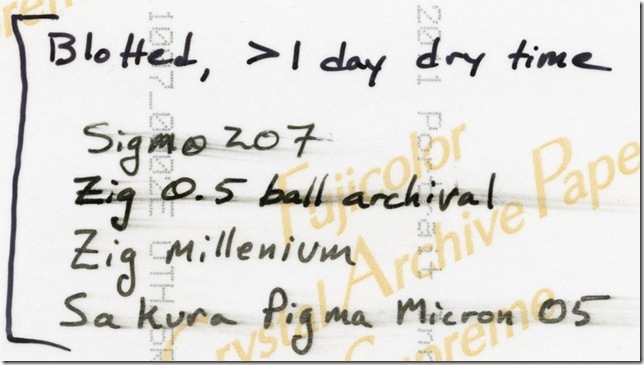 Inks designed to write on (drafting) “film” will dry, but almost all require a special pen. The cheapest and least special pen that works is a dip pen, which I use with Higgins Black Magic ink. I believe that Rapidograph Universal ink and Reeves and Poole Encre de Chine work too. Messy proposition. Thanks for this post! I am in the process of signing and dating the backs of my prints for the first time and I purchased the Zig Millennium after reading another article online. 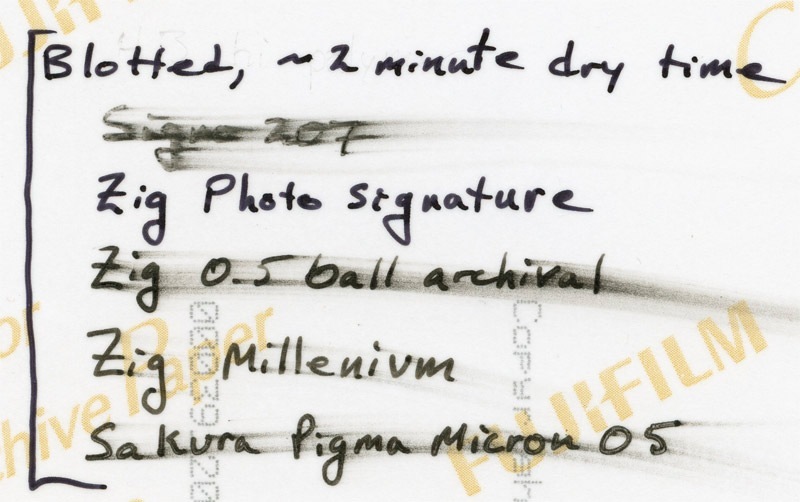 The writing did not smudge on the back of Kodak Metallic Endura but it is smudging on the back of the Lustre (with additional lustre coating). I googled and voila! You have all the answers I need! I’m off to bed and will let them dry overnight. Thanks a bunch for your helpful and clear testing! Pingback: Dip Pens for the Backs of Photos | Park.